Having fun the way you want it to be is one of the most exciting and memorable moments that could happen to your life, and there are many ways to have fun. Some people prefer to go to a beach, clubs, and bar to have a party but some choose more exciting ways of having fun and that is to go to zoos and marine parks to visit animals and know about their habitats. One of the most popular tourist destinations for animals is the Serengeti National Park in Tanzania, eastern Africa where you can find many kinds of animals that you can't see in a typical zoo's. Safari is one of the favorite tourist destinations where people were doing jungle ride a vehicle where they can sneak into any area of the jungle without any danger of wild animals. But one tourist experienced the hard way that wild animals are unpredictable sometimes. 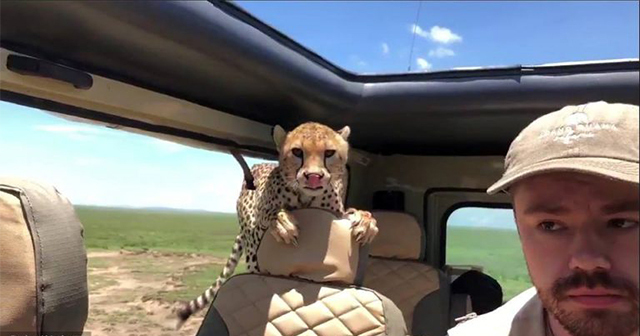 A recent post from a Facebook page named CGTN's went viral after a tourist was seen sitting in the front seat of a vehicle while a wild cheetah was at the back of his seat inspecting the interior of the vehicle. Netizens started to admire how to man reacted to the situation and praising him for staying calm even though his life is on the edge of danger. His face was terrified as if he could do nothing but to sit and stay calm. Running would be a terrible idea since we all know that the cheetah is the fastest runners in the animal kingdom. The safari guide told the tourist to stay calm and just don't say any word and let the cheetah explore the vehicle. The guide also told the tourist never to make an eye to eye contact with the cheetah. 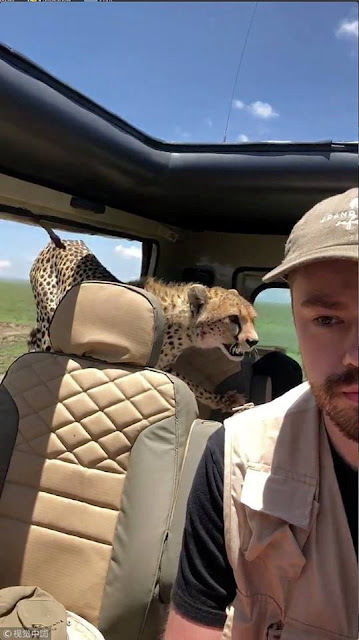 As seen in the video, the cheetah explored the vehicle for a couple of minutes and, those minutes seemed the terrifying minutes of the tourist life. Luckily the cheetah soon gets out of the vehicle without any violent actions. If you were in his situation what would you think you will do? I bet some will scream loud. Share us your thoughts.